This is the definitive handbook on the Schroth Method, written by the world’s foremost expert on the subject: Christa Lehnert-Schroth. 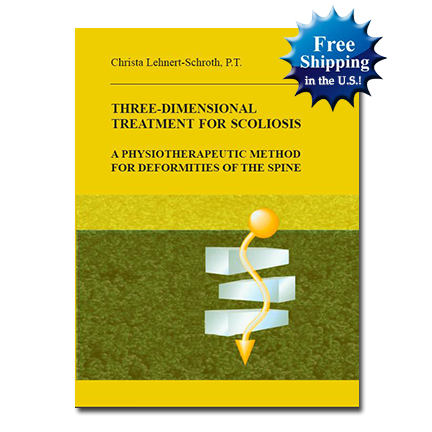 It is a must-have for therapists treating patients for scoliosis, as well as for the patients, themselves, to better understand their bodies and the appropriate exercises for their unique configuration. Since 1921, the Schroth method has played an important role in conservative management of scoliosis, in cases both mild and severe. This book describes every aspect of the scoliotic spine, and incorporates an extensive program of exercises that can be tailored to the specific needs of the individual. It also emphasizes psychological support as a key element. Author Christa Lehnert-Schroth worked with scoliosis patients for 50 years, applying and further developing her mother’s innovative, conservtive techniques with great success. From 1961 until her retirement in 1995, she directed the private Katharina-Schroth-Klinik in Bad Sobernheim, Germany, assisted by physicians, physiotherapists, and other medical professionals. Contains descriptions and photos of more than 100 scoliosis exercises to choose from, to suit individual patients. Shows exercises for scoliosis, Scheuermann’s kyphosis, flatback, hollow-back syndrome (hyperlordosis), lumbar kyphosis, spondylolisthesis, and related pathologies. Describes a 4-curve variety, which is fairly common and requires different exercises from the better-known three-curve cases. I have not had to wear a brace, I have no more sharp back pains, and have been able to run my hat store for 26 years. Sitting, walking, and most of all, breathing — all are much easier for me now. Before, I slouched into my rib hump and kept getting shorter. My quality of life is considerably better. I know how to carry myself, with my more than 100-degree curve. Now it does not matter to me how many degrees my curve is measured at. I walk completely differently. From the very beginning of Schroth treatment I experienced a complete rethinking in my head. Everything developed positively, like a miracle. I live well now. I even got taller, so that my thick back is scarcely noticed when I am dressed. I am much stronger and more self-confident, and can breathe again. I know how I need to position myself while asleep. I did not know these things before. I am so grateful to Frau Katharina Schroth and Frau Lehnert and the personnel of the clinic. I was so unhappy that I almost took my own life. Now I am content and full of life. Do you use the gold standard for treating clients with scoliosis? If you treat, or are likely to treat, patients with scoliosis, then Three-Dimensional Treatment for Scoliosis by Christa Lehnert-Schroth, PT, is an invaluable resource. While 3-D treatment is the gold standard in German physiotherapy, the method is new to me…We would serve our clients well if we integrated this European treatment style into practice. Read full review. The book is clearly laid out and reads well. A large amount of informative illustrations supplement the text. The author successfully represents the illustrated successions of movements in a manner that they can be translated into action. There follow many pages with exercise instructions, and finally a documentation section with photos, X-ray monitoring pictures and statistical evaluations of her treatment results. Thus this book truly belongs to the classics of conservative scoliosis therapy. Mrs. Lehnert-Schroth developed it to a level of perfection that today has found general recognition. The book is recommended. Its acquisition will be worthwhile for the orthopedist, for physical therapists, and of course also for scoliosis patients. Every physical therapist who wants to incorporate this method in his or her practice needs to read this book. The book should be a Must for doctors dealing with conservative treatment of scoliosis and presurgical treatment, because they should discuss the treatment plan with the physical therapist and the patient, and because they need to be capable of watching over and accompanying the treatment. The book addresses not only physical therapists and doctors but also the patients themselves. This work not only guides the physical therapist in treating scoliosis conservatively with success, but also represents an excellent theoretical and practical source of information for the patient. In a time in which the rapid increase of juvenile malpostures and spinal dysfunctions constitute a serious alarm signal, this book gives valuable advice for prophylaxis and early treatment (also for the educator). One wishes a world-wide propagation of this work for the benefit of scoliotics, who may then be able to look more optimistically to the future. This is a very important book in a time when the field of scoliosis treatment is interested almost only in operations and in reshaping by passive apparatus (braces), and when we do not practice physical exercises (though we theoretically recognize their value) with the necessary diligence.